Transitional times negate the “business as usual” approach. They offer the perfect opportunity to adopt a bold plan, to take a firm stand to differentiate yourself and your organization from the competition. Presented are viable options to create effective differentiation, to grow your organization, to enhance your profitability and to loyalize customers. This program enables you to discover your unique point of difference and how you can capitalize on it in a marketplace blinded by overexposure. 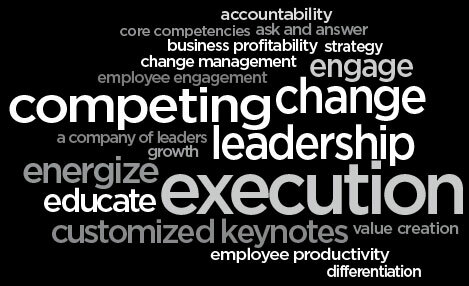 What makes you and your organization different from…better than your competitors? How do you exploit that difference and make it even more valuable? How do you communicate that difference to the marketplace? Identify the areas in your organization that will profit from differentiation. See differentiation where none seemed to exist before. Develop a “theatrical” approach that works in your environment. Use a differentiated communication and marketing strategy. Use differentiation to create a positive dilemma for your customers. Grow value through differentiated product, price, service and image. Communicate the importance of differentiation to co-workers/staff.